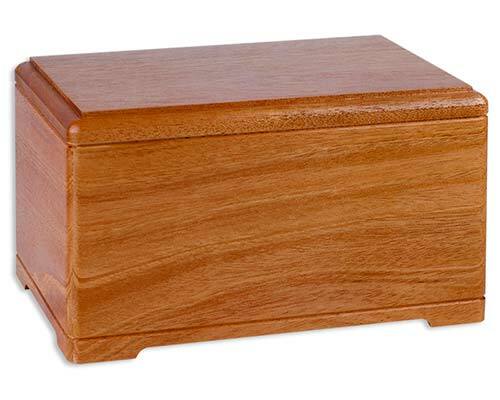 Wood is the perfect choice for a cremation urn. There is something peaceful and soothing about wood. The natural lines of the wood grain, created from years of undisturbed growth in the wild, soundlessly speak of towering trees beside the still waters of a mountain lake or the soft chirping of birds around a well-trodden forest foot path. A rustic wooden cremation urn creates a visual picture of earthy simplicity. Simple, yes, but with scarcely veiled depth. You can almost see the sunlight filtering through the trees overhead, and hear the crunch of boots on fallen branches scattered on the ground in nature’s original version of a Jackson Pollock painting. 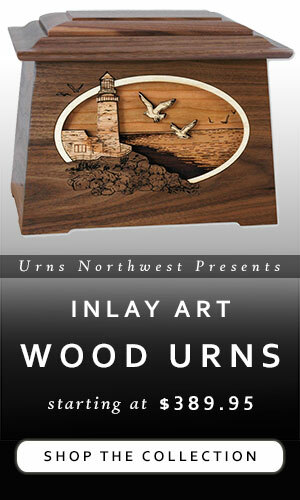 At Urns Northwest, we are experts on the subject of rustic wooden cremation urns. 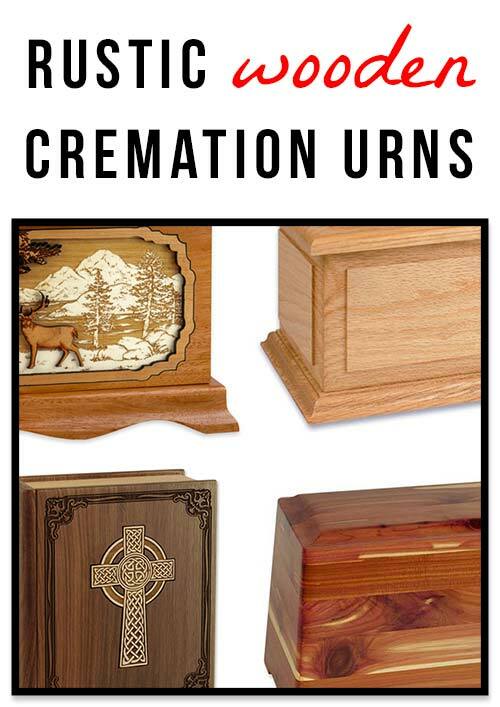 For more than 18 years we have been offering premium wood cremation urns. Just about every piece in our extensive collection is individually handmade in the USA by expert craftsmen. Our solid wood memorials come in an array of styles, wood types, designs, and sizes. 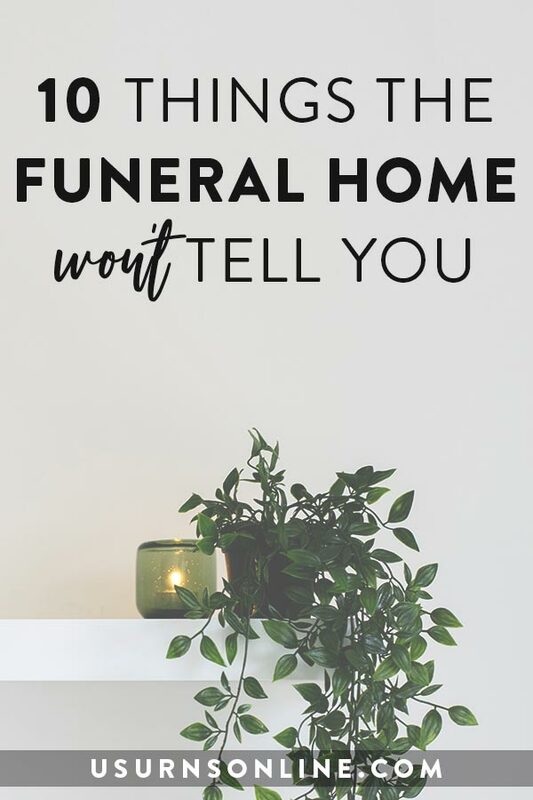 Plus we offer premium inlay wood art urns, custom laser engraving, and we readily work with our customers to ensure the urn gets delivered on time (full disclosure: that’s a big part of my job). The ten unique options for rustic wooden cremation urns listed below are all timeless masterworks made in America using solid hardwoods. I have included many of our most enduringly popular wood urns, and it will give you a glimpse into the wide variety of styles and designs that we provide. Each of these funeral urns conveys a surprising elegance when you see it in person. Please keep in mind that the memorials below are available in several different wood types. You will see the options for each item listed on the product page. 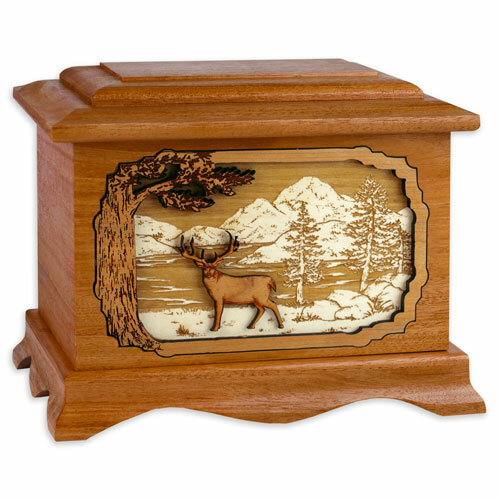 The “Deer by the Lake” design is is just one of many scenes in our premier line of wood art urns. The inlays are intricately cut and engraved from several types of wood, assembled into a layered inlay that gives the effect of 3-dimensions. 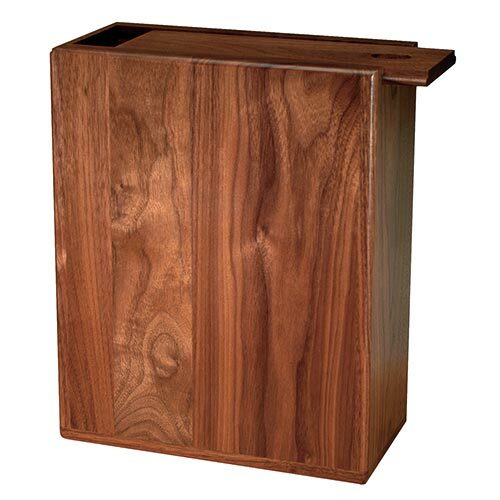 Above, the urn is pictured in our gorgeous solid mahogany. The series is also available in walnut, oak, or maple woods. Other art scenes include hummingbirds, fishing, soaring eagles, lighthouses, and much more. Our incredibly popular dimensional inlay art urns come in a companion size. That means it will hold the cremated remains of two people, often a husband and wife. The Rustic Cabin scene is a perennial favorite, and has that perfectly serene lakeside sensibility perfected by your choice of wood for the box. 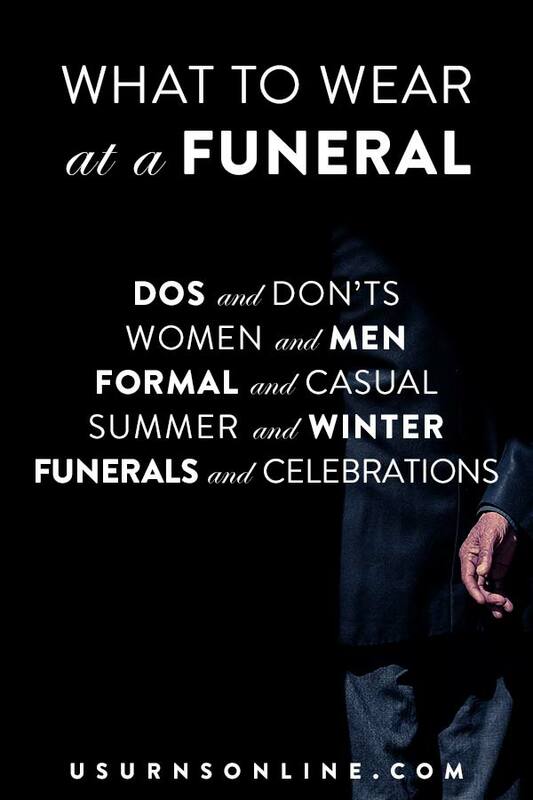 Shop all companion urns here. 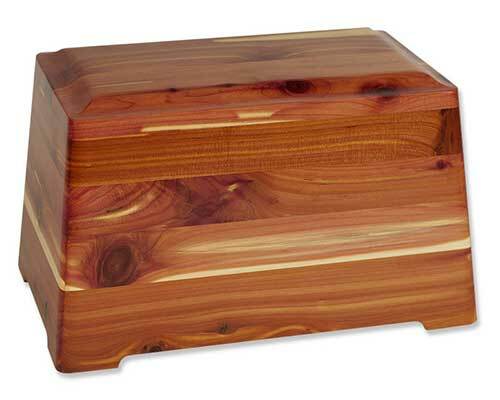 The Serenity Cedar Urn is one of our newest designs. Premium – and aromatic! – cedar wood is the highlight of this piece. 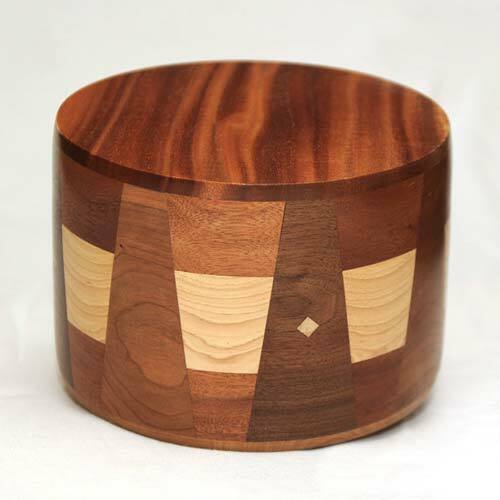 A deceptively simple shape allows the cedar wood grain to surprise and shine. 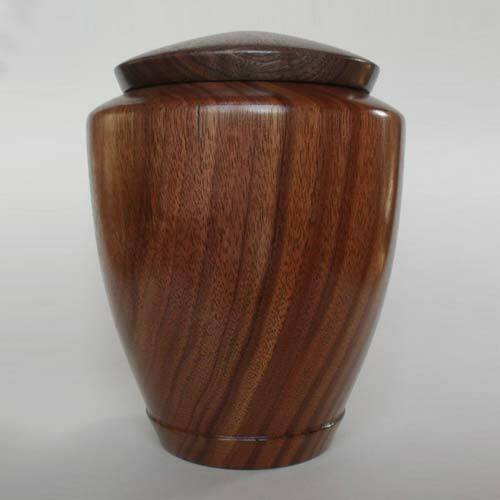 Using African Mahogany with Walnut and Maple inlays, this rustic wooden cremation urn is crafted by hand in a unique round shape. Each wood segment highlights the woodgrain patterns that exhibit the characteristics of each wood type’s natural look. Handcrafted in the USA. Woodturning is rising in popularity as a medium for memorial art cremation urns. This piece, handcrafted in the USA from a solid piece of walnut wood, showcases the artistry of the hand-turned woodworking process. 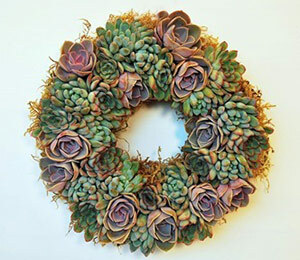 An elegant and refined memorial that retains a rustic and earthy sensibility. 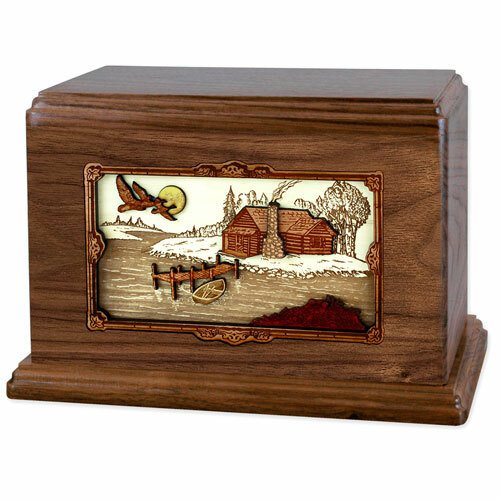 Crafted entirely of wood, this inlay art wooden cremation urn breathes of the pastoral simplicity found on the open road. 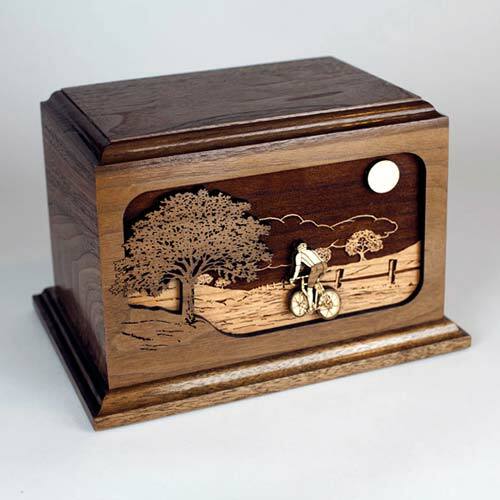 A lovely memorial for cyclists, the urn is made in the USA and available in walnut wood as shown or lighter oak. The Boston II is one of our most enduringly popular wood urn designs. Shown here in Oak, also available in Walnut and Cherry woods. This is also a favorite for couples in the companion size. Shown here in lush mahogany wood, the Hamilton is a gem of American made craftmanship. 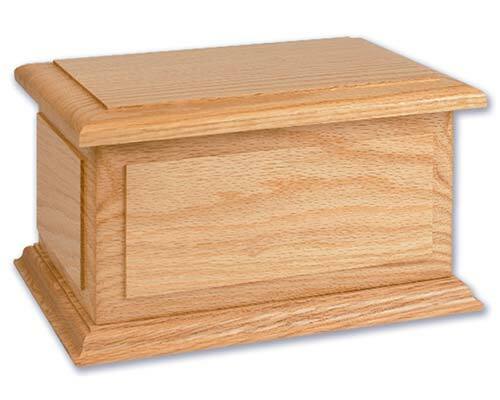 Made in solid premium wood yet still affordable, this simple and elegant wood urn is also available in cherry, oak, and walnut. 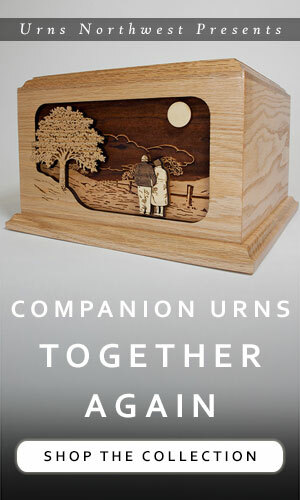 The “Together Again” is a companion sized urn designed to hold the ashes of two people. The inlay wood art scene depicts two people walking arm in arm down an old country lane as the sun sets in the distance. 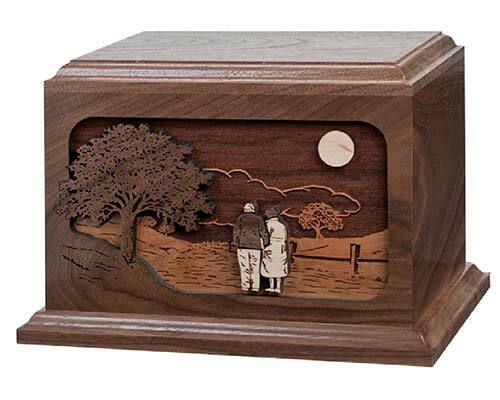 The “Soulmates” is another heartwarming and rustic wood companion urn for two people. This one depicts the couple sitting together on a lakeside bench. Their names and wedding date are etched into the back of the bench for a lovely personalized touch. 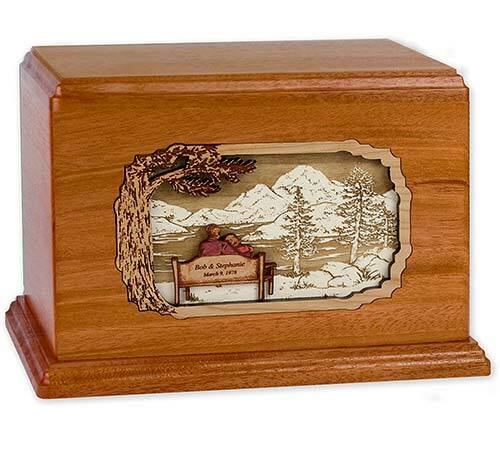 Designed specifically for scattering ashes, this rustic wooden cremation urn features a magnetic slide-lock closure for safe transportation and scattering. Made in the USA from genuine solid Walnut wood. 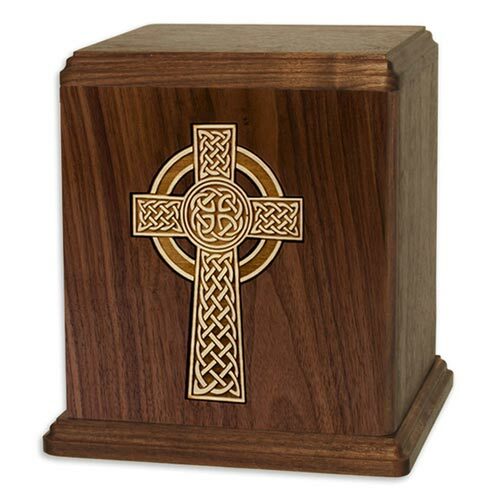 This solid walnut wood urn features a prominent Celtic Cross as an inlay. The Christian cross is etched from maple wood, set flush into the surface of the wooden cremation urn with rustic elegance and true crafstmanship. Made in the USA. Also available in a stunning “Bible” shape.